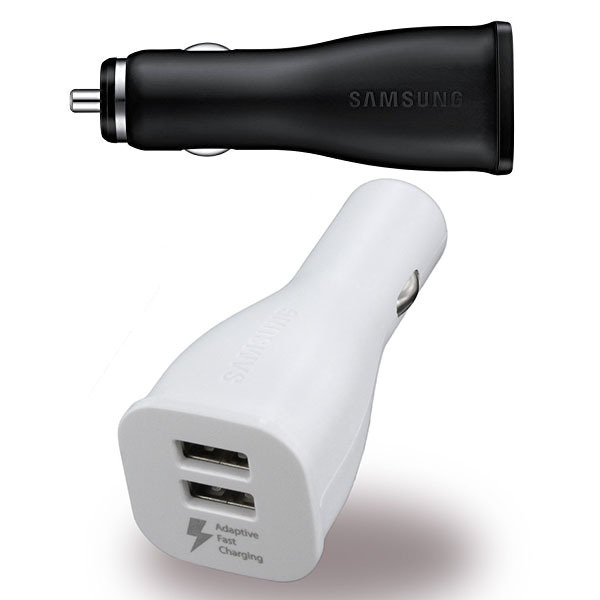 Dual Port Adaptive Fast Car Charger from Samsung. Please note, not all devices support fast charging. These car chargers are a step up on the usual adapters. They are compatible in 12-24V sockets and mean that you will never run out of charge whilst on the go. The twin ports mean that you are your passengers no longer need to fight over who's charging their phone. Samsung's fast charging technology is integrated into this adapter. In the fast paced age that we live, advancements like this are what we all want and Samsung certainly have delivered. Adaptive fast charge compatible devices are the Samsung Galaxy Note 7, S7, S7 Edge, Note 5, S6, S6 Edge, S6 Edge Plus. Please Note: These do not come in retail boxes. They are bulk packaged. Cracking little product, saved any further arguments with the mrs over who got to charge their phone on the way home, even better cos she has an iphone and i have an android and can do both at the same time.